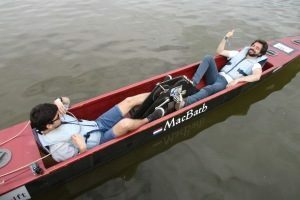 The MacBath is the main boat of DWTs fleet, and still a beauty. The boat is built before the 00's, but her builders already used carbon fibres in the construction. Furthermore, collaboration with MARIN including towing tank tests led to great hydrodynamic performance and a simple transmission system are key point why we are still content with the results she obtains after all those years. A special remarks has to be taken to the 3rd place in 100m Slalom in 2016, 15+ years after she's built! The A.F. Chapman II is originally from Chalmers University in Sweden, but became Delft's property after the team competed no longer in the IWRs. 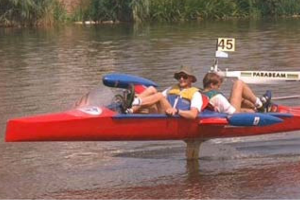 An ingenious steering systems allows to boat to be controlled in 5 degrees of freedom, according an airplane. As the builder was a pilot by his self, this is not strange at all, just like the enormous fanbase she has! After long time, DWT could make competitors of the IWR happy with the announcement of a competing A.F. Two years ago, after a long overhaul, she competed, but didn't fly. 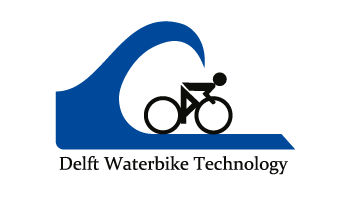 However, a collaboration with the waterbike team 'Straak zu Bremen' and an active group of Delft Waterbikers makes it a goal to fly during IWRs in short terms!